We have been talking about toddler schedules over in our Toddler Approved Positive Parenting Zone. Today I'm going to share my "perfect" schedule for 2-year-olds with you. I'd love to hear yours too! As an elementary school teacher I thrived on having a detailed daily schedule to structure our day. When I became a first time mom the schedule went out the window for awhile as I tried to figure out how to balance life and where to put things. My first child was a terrible sleeper, so often our mornings between 8-11am were where he got his best sleep... which meant that I never left the house til later in the day... if at all. When my second and third kids came along for the most part our schedule had to stay consistent. Kids had school or scheduled events and a new baby got to just come along for the ride. As my kids entered toddlerhood we typically started getting more sleep at night (although sometimes we didn't) which meant we woke up earlier and got a more organized start to our day. I finally began to start having a more consistent schedule again and I loved it! I've discovered that I am a much happier person when we have some sort of routine to our day and so are my kids! The schedule I am sharing today would be my ideal schedule to keep most days... though it is usually interrupted with emergency trips to the doctor or last minute errands or school pick ups or whatnot. This is NOT what actually happens in our day every day. I WISH it could though. When we have regular days without anything crazy going on then this is the schedule I aim for! Below is my schedule. I'll explain in more detail what each activity is underneath the schedule. We don't do every activity on every line. The "::" sign indicates the options I pick between during that time frame. My preschooler goes to preschool some mornings and joins us for activities some mornings too. I also have a first grader who is at school all day and joins for activities in the late afternoon. Though, in my perfect world the kids would sleep in until 8! :) I am grateful that they at least sleep til 7am (typically). My first grader goes to school late morning so we are lucky to have extra time in the morning together. After we drop him off we usually go on an adventure. Somedays I am in the car doing drop offs from 8am-9:30am and none of these activities happen! I host a toddler book club once a month in my home and a weekly park day for moms at local parks. I also host a preschool co-op some weeks. As you can see, our days vary a lot between 10am-12pm. We don't do all of these activities, just one or two. Sometimes we'll run a quick errand and also go to the park. On toddler book club or playgroup days we just do that between 10-12 and errands wait till the kids are in bed and my husband is home. A nature walk could be around our neighborhood or we might go hiking in the open space near our home. Often I will push my two younger kids (ages 4 & 2) in the double jogger and we'll run to the park, play, and come home so that I can get a workout in. I love reading books to the kids while they eat lunch! This week we are loving books by Eric Carle. My toddler typically naps for 2 hours every day while my preschooler plays mostly quietly in her room (with occasional interruptions). Sometimes we skip naptime and go on an adventure instead! 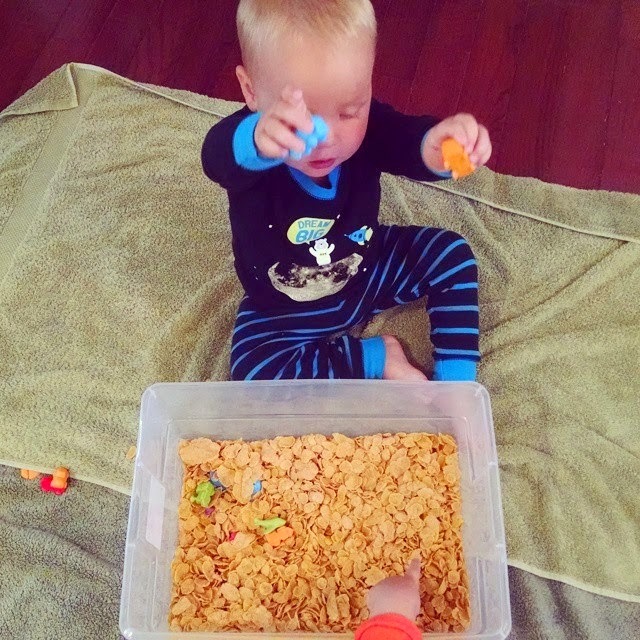 The kids sometimes play games or do some of our favorite simple toddler play activities. My kids don't get a bath every day and sometimes we scrap this entire schedule and just watch a movie after dinner. We do try and do something creative and something together every night, in addition to cleaning. 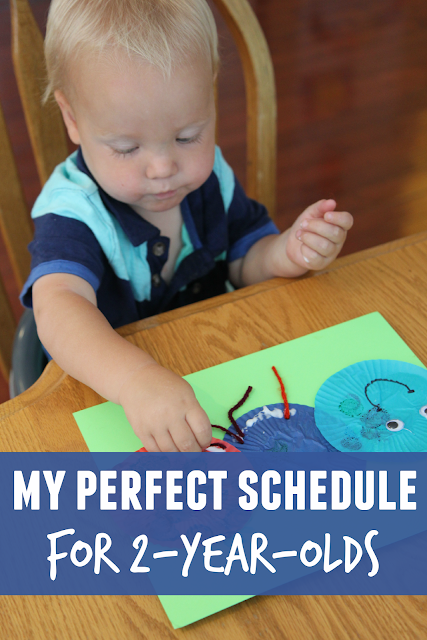 Now that I have shared my "perfect" schedule with you I'm going to explain what sort of activities I fit into the different sections. I also have an entire pinterest board with cool sensory play ideas for kids that I pull from sometimes. Kids typically just play in their rooms or in our playroom or sometimes in the backyard. This is unstructured and I just encourage them to find something to do. Sometimes they will pull out playdough or art supplies, but usually they are doing pretend play, playing with trains and cars, or playing with DUPLO. Our toddler book club features a new children's book each month. 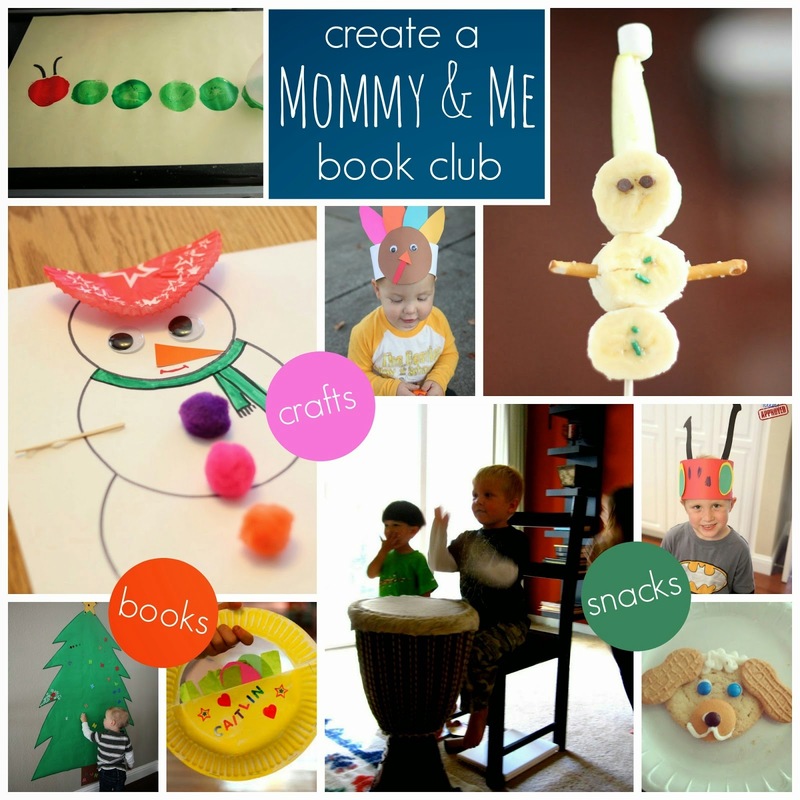 I shared a bit about the organization for our Mommy and Me Toddler Book Club here. We have 7 children attend each month between the ages of 18 months and age 3 along with their moms. 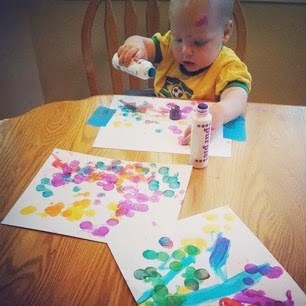 We do simple crafts, read a book, play games, do sensory activities, have a snack, and play. Playgroup is just when we get together with a few kids and moms and it is less structured/organized. The moms chat and the kids play. I use a variety of strategies to get all of my kids involved in cleaning and chores at our house. I try and have my kids clean their bedrooms and the playroom (actually our living room) every day. Sometimes it happens, sometimes it doesn't. Now that I've shared my schedule, I'd love to hear yours? Do you have a schedule you try to adhere to? As mentioned above, this schedule does not happen every day! Somedays all we do is pick up the house and run errands, some days I have work projects to get done and the kids play independently and watch far too many movies. But somedays we manage to have time for creativity, chores, AND fun and we stick to our schedule and I feel awesome! I love this! I have 3 under 5, and the youngest still sleeps twice a day, but our schedule works pretty much the same as yours, except we start at 6 and finish by 6.30. I love that the big kids get a chance to do some craft activities whilst my 1yo is sleeping, they just love it, and I can get a few chores done myself. I also love the idea of readings while they have lunch, I hadn't thought of that but it would work really well for all 3. Thankyou for sharing your ideal day, and reminding us that it doesn't always work that way! Life happens. I have a similar day. My almost 2 year old has plenty of independent play, of course a bit of tv if we're too tired or on day 10 of frigid temps. But she is such a routine kid, if I push her or mess with the day, it shows big time in her behaviors. Maybe our future kids will be more go-with-the-flow but the basic structure of our day has been great for us. 7:15 seems a little early for bedtime to me. Mine was in bed by 830-9:00. Then she'd wake up about 8:00am. Just my opinion though. I absolutely love this schedule. I have a1 year old and a 2 year old that have Soooo much energy. I'm going to try this out and I bet they will live it. Thank you so much for posting this. Very similar to my schedule, however I work, but my son is home with dad, when I get home we switch and my husband goes to work. I was given advice to place child on a schedule from day 1 . It was the best advice I was given! I never have problems when I say it's time to stop a fun activity or when it's time for bed. I always give a 10 minute warning, and my son is good with that. Not silly at all! You can make edible playdough if you are worried about them eating it. There are a lot of great recipes on pinterest. My 23 month old twins still put everything in their mouth too!! I'm going to try edible playdough too! I have been looking for ways to encourage my two year old twins to interact at lunch time. I LOVE your idea of reading books to them. Thank you for the idea!! Same here! I work 2nd shift most days from home. My two-and-a-half-year-old goes to bed around 12 12:30. But then he sleeps until about 10. It works for us because I am on the same schedule as he is. My kiddo also sleeps till 11, naps late and stays up till 1 or 2am. She is on her own little schedule. I liked at first that I could sleep in, but I feel very nonproductive most days. I have a question at what time do you guys do the home cleaning? I have four kids 3 boys and 1 girl. My boys are 4,3,2 and my girl is 6 months. Yes i know sounds crazy. Am always stress out too and i just dont know how to handle it at times. The boys are so active that sometimes i go crazy not knowing what to do. Any advices would help. My kids help me pick up either before or after dinner. My Daughter is 2.5 and no matter how early I wake her up she refuses to go to bed until 12/2. I am currently 18 weeks pregnant and need to get my daughter on a schedule. But with my bf's work schedule it's quite hard. He works 2 days on 2 days off then 3 days on and vise versa the next week. And the times are 6 am to 6 pm and 6 pm to 6 am. So when I want to put her down on the nights he comes home at 6pm he's wanting to stay up and watch TV which keeps her up sometimes. :-/ I don't really know what to do. I'm going insane. Thanks in advance. I work 5 days a week but we have a very similar routine on the weekends. I have a 1 and 3 year old. When do you shower and clean your house like the bathrooms? I typically do it while they nap but curious what you do. Jennifer- I hate to waste naptime/bedtime cleaning. I typically use that time to work since I work from home. When the kids are awake I do a variety of cleaning tasks. Often I will get my 3-year-old involved with wiping things down, sorting laundry, etc. I just bring my 9 month old along with me and keep toys nearby for her to play with. If I am mopping the floor or something I will strap her into a high chair nearby with a snack. I typically shower in the morning when the kids are awake and already fed and happy. I just keep toys in my bathroom and the kids play while I shower quickly. My 9 month old loves holding her own brush while I brush my hair and having me blow her with the hair dryer when I am blow drying my hair. I try and keep special toys in my bathroom/room (hidden away) so they only get to play with them when I shower. It keeps them more engaged. how do you include milk in terms of timings in this schedule? Milk would be included when the child eats or is thirsty, so that would change daily most likely. My kids aren't big milk drinkers by the time they are 2. Great article! I have a 2 yr old son and this is starting to become our schedule..def more structured. It is helping to glance at the clock! I am going to try out some of these learning activities too Thank you. Also I have been mostly at home with my son but I am looking for work and I guess we'll see the adjustments! I'm looking into daycare for my son now any advice?? I'm impressed that your kids don't watch tv. How do you do that if they asked for it? We watch TV sometimes, but we provide dozens of other opportunities and activities and play tools. TV is just one additional tool for entertainment in our house. If kids ask for it, we just say no- just like if they asked to go to the park and there wasn't time or if they asked for candy and it was almost dinner and we didn't want them to eat it then. We have certain times each week when kids can have technology time or when we watch a family movie. Those are special. Occasionally if kids are sick, we'll watch a lot of extra TV. I find that my kids are extra grumpy and their ability to be creative in their play is stifled when they watch too much TV, which is why we keep it off most of the time.